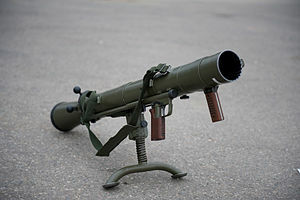 The Carl Gustaf recoilless rifle (Swedish pronunciation: [ˈkɑːɭ ²ɡɵsːtav]) is an 84 mm man-portable reusable anti-tank weapon produced by Saab Bofors Dynamics (formerly Bofors Anti-Armour AB) in Sweden. Introduced in 1946, it was one of the many recoilless rifle designs of that era. While similar weapons have generally disappeared from service, the Carl Gustaf is still being made and remains in widespread use today. The Carl Gustaf is a lightweight, low cost weapon that uses a wide range of ammunition, which makes it extremely flexible and suitable in a wide variety of roles. In Sweden, it is officially called the Grg m/48 (Granatgevär – "grenade rifle", model 1948). British troops refer to it as the "Charlie G", while Canadian troops often refer to it as "Carl G". In U.S. military service, it is known as the "M3 Multi-Role Anti-Armor Anti-Personnel Weapon System" (MAAWS) or "Ranger Anti-tank Weapons System" (RAWS), but is often just called the "Gustaf Bazooka", "Gustaf", or "Goose". In Australia, it is irreverently known as "Charlie Gutsache" (guts ache, slang for stomach pain), or "Charlie Swede". The Carl Gustaf M1 was developed by Hugo Abramson and Harald Jentzen at the Kungliga Arméförvaltningens Tygavdelning ("Royal Swedish Arms Administration") and produced at Carl Gustaf Stads Gevärsfaktori from where it derives its name. The weapon was first introduced into Swedish service in 1948 as the 8,4 cm Granatgevär m/48 (Grg m/48), filling the same anti-tank role as the U.S. Army's bazooka, British PIAT and German Panzerschreck. Unlike these weapons, however, the Gustaf used a rifled barrel for spin-stabilizing its rounds, as opposed to fins used by the other systems. The use of the recoilless firing system allowed the Gustaf to use ammunition containing considerably more propellant, firing its rounds at 290 m/s (950 ft/s), as opposed to about 105 m/s (340 ft/s) for the Panzerschreck and Bazooka and about 75 m/s (250 ft/s) for the PIAT. The result was superior accuracy at longer ranges. The Gustaf can be used to attack larger stationary targets at up to 700 m (2,300 ft), but the relatively low speed of the projectile restricts attacks on moving targets to a range of 400 m (1,300 ft) or less. The Gustaf was soon sold around the world and became one of the primary squad-level anti-tank weapons for many West European armies. An improved, lighter and slightly shorter version, the Carl Gustaf M2, was introduced in 1964 and quickly replaced the original version. The current Carl Gustaf M3 version was introduced in 1991. It reduced the weight even further by replacing the forged steel tube with a thin steel liner containing the rifling, strengthened by a carbon fiber outer sleeve. The external steel parts were also replaced with plastics and aluminium alloys. In recent years, the M3 has found new life in a variety of roles. The British Special Air Service, United States Army Special Forces and United States Army Rangers use M3s in bunker-busting and anti-vehicle roles, while the German Bundeswehr maintains a small number of M2s for battlefield illumination. Many armies continue to use it as a viable anti-armor weapon, especially against 1950s- and 1960s-era tanks and other armored vehicles still in use worldwide. In November 2011, the U.S. Army began ordering the M3 MAAWS for regular units deployed in Afghanistan. Soldiers were being engaged with RPGs at 900 meters, while their light weapons had effective ranges of 500–600 meters. The Gustaf allows airburst capability of troops in defilade out to 1,250 meters, and high explosive use out to 1,300 meters. While the weapon provides enhanced effectiveness, its 9.5 kg (21 lb) weight burdens troops. On 28 March 2013, USSOCOM announced a call for sources to develop a kit to lighten the M3 MAAWS and reduce overall length without affecting handling or ruggedness. By that time, Saab was developing a weight-reduced version prior to the SOCOM release that demonstrated no decrease in performance, no increase in recoil, and nearly equivalent barrel life that could be ready for government testing in 2014. Saab has also developed a new high explosive round that has a direct fire range of 1,500 meters when using a fire control system. At AUSA 2014, Saab Dynamics displayed its new Carl Gustaf M4 variant. Compared to the M3 MAAWS, the M4 is 3.4 kg (7.5 lb) lighter, weighing 6.6 kg (15 lb), and shorter with a 950 mm (37 in) overall length. The shorter length was in response to the need to wield the weapon in urban terrain, and weight savings were achieved through using lighter components whenever possible including a carbon fiber tube with titanium liner, as well as a new venturi design. Other new features include a red-dot sight, a travel safety catch to allow the M4 to be carried while loaded, an adjustable shoulder rest and forward grip for improved ergonomics, a shot counter to keep track of how many rounds have been fired to manage the weapon's 1,000-round barrel life, picatinny rails for grips and sight mounts, and a remote round management function so intelligent sights can "talk" to programmable rounds. The Defense Department agreed to evaluate the shorter and lighter M4 version over the next two years; testing and qualifications were planned to be completed in spring 2017, and the weapon type classified as the M3E1 in fall 2017, making the system available for procurement to all Department of Defense services. The first unit is planned to be equipped with the M3E1 in 2018. In April 2019, a contract of SEK168 million (USD18.1 million) was approved to supply the Australian Army with ammunition for the Carl-Gustaf M4 84 mm multipurpose weapon systems ordered by the service in September 2018. In May 2009, U.S. Army Special Forces soldiers train with the Carl Gustaf recoilless rifle in Basra, Iraq, during the Iraq War. Note the firing position and backblast. The basic weapon consists of the main tube with the breech-mounted Venturi recoil damper, with two grips near the front and a shoulder mount. The weapon is fitted with iron sights, but is normally aimed with the attached 3× optical sight with a 17 degree (300 mil) field of view. The most modern variants fielded by Swedish rifle companies have been fitted with the Swedish Aimpoint sighting system. Luminous front and rear sight inserts are available for the iron sights when aiming at night, and an image intensification system may also be used. The Gustaf can be fired from the standing, kneeling, sitting or prone positions, and a bipod may be attached in front of the shoulder piece. An operating handle called the "Venturi lock" is used to move the hinged breech to one side for reloading. The weapon is normally operated by a two-man crew, one carrying and firing the weapon, the other carrying ammunition and reloading. FFV401 is an Area Defence Munition designed as a close-range anti-personnel round. It fires 1100 flechettes over a wide area. 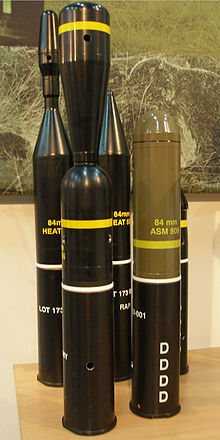 FFV509 is an ASM (Anti-Structure Munition), designed especially for destroying buildings and other types of urban constructions. The fuse has two modes, impact or a delayed function. HEAT 655 CS (Confined Spaces) "high-explosive anti-tank (HEAT) round that can be fired by the 84 mm Carl Gustaf recoilless weapon from within small enclosures." FFV756 is an MT (Multi Target) ammunition, designed for combat in built-up areas and for incapacitating an enemy under cover inside a building or some type of fortification. The MT 756 uses a tandem charge. Guided Carl Gustaf Munition (GCGM) is a laser guided projectile developed between Saab and Raytheon, featuring a multi-target warhead capable of defeating bunkers and moving light armored vehicles at a range of 2,000 m and capable of being fired from enclosed spaces; demonstrations planned for 2020. The M3 Multi-role Anti-armor Anti-tank Weapon System (MAAWS) is the U.S. military designation for the Carl Gustaf M3 recoilless rifle. It is primarily used by United States Special Operations Command such as the Army Rangers, Army Special Forces, Marine Raiders, Navy SEALs, and JSOC operators. When used by the U.S. Army's 75th Ranger Regiment, the M3 is known as the Ranger Anti-tank Weapons System (RAWS). In the late 1980s, the Special Operations Forces Modernization Action Plan indicated need for a Ranger Anti-Armor/Anti-Personnel Weapon System (RAAWS) to replace the M67 recoilless rifle in use by the 75th Ranger Regiment. A market survey in 1987 indicated that the Carl Gustaf M3 was the best candidate for satisfying RAAWS requirements. On 29 September 1988, the M3 was selected as the RAAWS from candidate proposals submitted in response to the market survey compiled by ARDEC. A subsequent review of the contractor-supplied fatigue test data determined that the data did not meet U.S. Army requirements. Benét Laboratories conducted fatigue test of two tubes to establish an interim safe service life for the weapon. Tests were conducted in 1993. The manufacturer’s recommended life for the weapon was 500 rounds, but bore surfaces showed no indications of erosion until 2,360 rounds. The U.S. Navy SEALs became interested in the program and moved it to a Joint Integrated Product Team. The program name subsequently changed from the RAAWS to the Multi-Role Anti-Armor Anti-Personnel Weapon System (MAAWS). Army Rangers found the M3 was best employed using a two-man team. One person would carry the launcher and be armed with a pistol for personal protection, and the other would carry 5–6 rounds of ammunition and act as a spotter for the gunner. Although the single-shot AT-4 is lighter and can be carried by one person, a Gustaf team with the heavier recoilless rifle can reload and fire more rounds. In late 2012, the Army fielded 58 M3s and 1,500 rounds of ammunition to units deployed to Afghanistan to destroy enemy targets out to 1,000 meters. This was because RPG and machine gun teams could attack 900 meters away, while existing weaponry like the M141 Bunker Defeat Munition, M72 LAW, M136 AT-4 and MK153 SMAW had effective ranges of only 500 meters. The AT-4 is lighter and cheaper but is made of reinforced fiberglass, while the M3's rifled metal/carbon fiber launch tube allows for reloading. Employing the 22 lb M3 is easier than the 50 lb FGM-148 Javelin with its launcher with missile and reusable command launch unit, is faster than waiting on mortars, and is cheaper than the Javelin and artillery shells for engaging targets in hard cover. Although Special Operations forces had been using the M3 since the early 1990s, light infantry unit commanders in Afghanistan had to submit operational needs statements to get the weapon. The M3 became an official program of record in the conventional Army in 2014, and a conditional materiel release was authorized in late 2015 to equip all brigade combat teams with one M3 launcher per infantry platoon. In 2017, the U.S. Army approved a requirement for 1,111 M3E1 units to be fielded to soldiers as part of an Urgent Material Release. The M3E1 is part of the Product Manager Crew Served Weapon portfolio. A key benefit of the M3E1 is that it can fire multiple types of rounds, giving soldiers increased capability on the battlefield. By using titanium, the updated M3E1, based on the M3A1 introduced in 2014, is more than six pounds lighter. The M3E1 is also 2.5 inches shorter and has an improved carrying handle, shoulder padding and an improved sighting system that can be adjusted for better comfort without sacrificing performance. The wiring harness was included in the M3E1 configuration that provides a foregrip controller and programmable fuze setter for an interchangeable fire control system. For added safety and cost savings, an automatic round counter enables Soldiers and logisticians to accurately track the service life of each weapon. The M3E1 uses the same family of ammunition as the M3, which has been successfully tested. In November 2017, the U.S. Marine Corps announced they planned to procure the M3E1 MAAWS. 1,200 M3E1s would be acquired with one fielded to every infantry squad. In addition to infantry use, the Marines are considering it to replace the SMAW in combat engineer squads. While the SMAW weighs 2.5 lb (1.1 kg) less loaded, the MAAWS has a greater variety of ammunition available and a maximum effective range of 1,000 meters, twice that of the SMAW; the Marines plan to test both weapons' effectiveness against bunkers to inform their decision. Soldier fires a Carl Gustaf. Note the significant back-blast. The overpressure or blast wave generated by the Gustaf, will cause blast and burn related injuries to those behind the gun, and is dangerous to 30 meters and hazardous to about 50 to 75 meters. Repeatedly firing the Gustaf can also cause related shock wave injuries to gunners and those nearby. As a result, during training, gunners are only allowed to fire six rounds a day. The assistant gunners would also often move away from the overpressure zone, so that they too can fire six rounds a day. Brazilian jungle warfare soldier carrying a Carl Gustaf M3. JGSDF Western Army Infantry Regiment soldiers operating the Howa 84RR in February 2014. The Howa 84RR is a Japanese-made version of the Carl Gustaf. Myanmar: used by divisional heavy weapon companies in bunker busting/infantry support/light artillery role for counter-insurgency campaigns. Clones made as MA-14. Slovakia: M3, launch customer for the M4 variant, which became operational in July 2017. Netherlands: The M2 was in service with the Royal Netherlands Army since 1964, known as the Terugstootloze vuurmond (TLV) 84 mm, Carl Gustaf M-2. It is used in combination with the Kijker, richt, recht, 2x12 Wöhler scope. The same model was also used in the Dutch Marine Corps, where it was known as the Terugstootloze vuurmond (TLV) van 84 mm, Carl Gustav, M2. It was replaced by the Panzerfaust 3. ^ "YouTube". www.youtube.com. Retrieved 29 October 2017. ^ a b Exhibition of Equipments, JP: Plala, archived from the original on March 13, 2012, retrieved July 29, 2008 . ^ "SOCOM Seeks Lighter Carl Gustaf". Defense media network. 22 April 2013. .
^ "Saab awarded ammunition contract for Australian Army's Carl-Gustaf M4 weapon system | Jane's 360". www.janes.com. Retrieved 2019-04-17. ^ a b c "THE 84 mm carl-gustaf Multi-purpose Weapon System" (PDF). ^ "Saab reveals confined spaces capability for Carl Gustaf", Infantry Weapons, Jane's . ^ The Carl Gustaf is getting a ‘game changing’ laser-guided munition. Army Times. 9 October 2018. ^ "Saab, Raytheon to Demonstrate a Guided Munition for Carl Gustaf M4 Recoilless Rifle - Defense Update:". ^ a b "Saab to Supply Carl-Gustaf 84mm Recoilless Rifle System to the U.S. Army", SA defense journal, 19 June 2013 . ^ Carl Gustaf Rules In America, Strategy page, 10 September 2014 . ^ "Do U.S. Troops Risk Brain Injury When They Fire Heavy Weapons?". npr.org. Retrieved 29 October 2017. ^ "Pentagon Shelves Blast Gauges Meant To Detect Battlefield Brain Injuries". npr.org. Retrieved 29 October 2017. ^ "Blast Overpressure Is Generated From The Firing Of Weapons, And May Cause Brain Injury". sciencedaily.com. Retrieved 29 October 2017. ^ "A swedish infantryman after a long day of firing the Carl-Gustaf". reddit. Retrieved 29 October 2017. ^ Infodefensa.com (31 August 2016). "Argentina adquiere cañones sin retroceso Carl Gustaf y un radar de vigilancia terrestre - Noticias Infodefensa América". infodefensa.com. Retrieved 29 October 2017. ^ "Carl Gustaf , AT-4CS y fusiles Steyr HS.50 M1 para el Ejército Argentino". zona-militar.com. 27 October 2017. Retrieved 29 October 2017. ^ a b c d e f g h i j k l m n o p q r s t u v w x y Jones, Richard D. Infantry Weapons 2009/2010. Jane's; 35 ed. (January 27, 2009). ISBN 978-0-7106-2869-5. ^ "Direct fire support weapons land 40 phase 2". Defence Material Organisation. October 2010. Archived from the original on 10 April 2011. Retrieved 24 April 2011. ^ a b "Grenade", World, RU: Guns . ^ Infodefensa.com (21 December 2018). "La II División realiza instrucción de tiro con el sistema 'Carl Gustav' - Noticias Infodefensa América". infodefensa.com. Retrieved 29 December 2018. ^ Karl Gustaf protitanková zbraň (in Czech), CZ: Army . ^ "Dysekanon M/79", Panser værns våben (in Danish), DK: Dansk panser . ^ "Dysekanon M/85", Panser værns våben (in Danish), DK: Dansk panser . ^ 84 mm tankitõrjegranaadiheitja Carl-Gustav M2 (in Ewe), EE: Military . ^ "Armored vehicle weapons in formation", Greek Army ground forces military equipment, Army Recognition . ^ "DRDO Develops New 84mm Lightweight Anti-Tank System". India. ^ "Kopassus & Kopaska – Specijalne Postrojbe Republike Indonezije" (in Croatian). HR: Hrvatski Vojnik Magazine. Archived from the original on 2010-08-22. Retrieved 2010-06-12. ^ Kuwait – Army Equipment, Global security . ^ Prieštankinis granatsvaidis AT-4 (in Lithuanian), LT: KAM . ^ Prieštankinis granatsvaidis "Carl Gustaf" M2, M3 (in Lithuanian), LT: KAM . ^ "Svenska vapen hos Burmas arme" [Sweden sells to Burma’s army], SvD (in Swedish), SE . ^ Altair, PL, archived from the original on 2010-03-26 . ^ Exercício Capolo no distrito de Santarém [Capolo exercise in the Santarém district] (in Portuguese), PT: Operacional . ^ "Armas", Meios dos fuzileiros [Marines’ equipment] (in Portuguese), PT: Marinha . ^ Rottman, Gordon L. (1993). Armies of the Gulf War. Elite 45. Osprey Publishing. p. 30. ISBN 9781855322776. ^ Tomkins, Richard (18 July 2017). "Slovakia deploys Saab's Carl-Gustaf M4 weapon". United Press International. Archived from the original on 18 July 2017. Retrieved 18 July 2017. ^ Army, LK, archived from the original on 2011-12-17 . ^ The World defense almanac 1996–97, p. 32 . ^ Robinson, Spc Nigel (2011-10-27). "Carl Gustaf Recoilless Rifle". 7th Mobile Public Affairs Detachment. Defense Video and Imagery Distribution System. Retrieved 15 November 2011. ^ "U.S. Army Orders Additional Carl-Gustaf Weapon System", Defense talk, 27 September 2012 . ^ "Carl Gustaf Selected as Standard Equipment for U.S. Army Light Infantry Units", Deagel, 20 February 2014 . ^ "US Army approves Carl Gustaf M3 MAAWS for general use", IHS Janes, 16 May 2016 . ^ Talens, Martien. De ransel op de rug deel 2. Brabantia Nostra. p. 400. ^ Gmelich Meijling, J. C. (1998-02-09). "Brief staatssecretaris - Anti-tankwapens". Retrieved 2018-02-14. ^ "Army News – Issue No. 235" (PDF). Ministry of Defence, Singapore. 2015. Archived from the original (PDF) on 2015-06-23. Retrieved 2015-06-23. ^ AE84-RCL recoilless rifle, AEI Systems, retrieved September 16, 2014 . Wikimedia Commons has media related to Carl Gustaf recoilless rifle.